No slits! No thread! Take a borrowed Pad! Borrow a paper pad (Post-it) and let the spectator sign the front page. 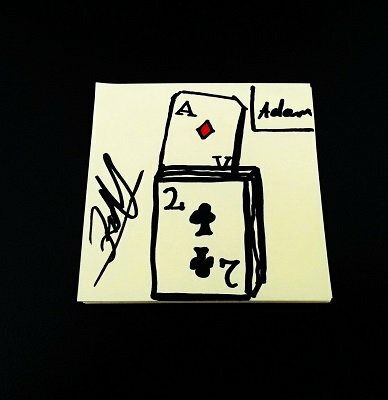 After you draw the wrong card you add a few lines to make a box. Then the chosen card rises out of the drawn box. After that you rip of the signed paper and fold it (if you wish) and heat up with a lighter (you don't have to do this). When the spectator opens the paper, the card is gone. He could check the pad and keep all items as a souvenir! No threads, no slits! (like the first Version). If you follow the routine you end up clean. You can build the gimmick in a few minutes. Note: This effect is inspired by Martin Lewis's Cardiographic . 1st edition 2016, length 34 min.